Weight, denotes a method of ascertaining the quantity of any solid or fluid body, by means of the balance, or otherwise. In the year 1779, the Society for the Encouragement of Arts, etc. conferred a bounty of 30 guineas on Mr. Thomas HattoN, for his "Attempt to find, by Approxi-motion, an Universal Standard. "- Mr. H.'s plan consists in applying a moveable point of suspension to one and the same pendulum, in order to produce the full effect of two pendulums, the difference of the length of which, is the intended measure. An abstract of Mr. Hat-ton's memoir, will, be found in the 1st vol. of the Society's Transactions. Several years having elapsed without his suggesting any farther improvement, Mr. Whitehurst proposed, in 1787, " An attempt towards obtaining an invariable measure, length, and capacity, from the mensuration of time; independently of the mechanical operations, necessary to ascertain the true length of pendulums." - In short, his contrivance is founded on Mr. H.'s apparatus, in an improved state; and the inquisitive reader, who is desirous of farther information, will consult Mr. W.'s elaborate essay (4to. 63. Bent) ; the title of which has before been specified. 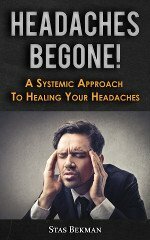 Numerous abuses, relative to weights and measures, are also stated, with appropriate remedies, in the late Sir John RIggs Miller's " Speeches in the House of Commons, upon the Equalization of the Weights and Measures of Great Britain, "etc. (8vo. pp. ; 28, 2s. 6d. Debrett, 1790); - in the late Sir James Stuart's " Plan for introducing an Uniformity in Weights and Measures, within the Limits of the British-Empire" (8vo. pp. 64, 1s. 6d. Stockdale, 1790); - and in Sir George Shuckburgh Evelyn's Memoir, inserted in the "Philosophical Transactions of the Royal Society, " for 1798. - As, however, a specification of their different plans, would be incompatible with our limits, we shall give our readers an account of the new French weights and measures; because they frequently occur in translations of works from that language. The principal measure of length is the metre, which is equal to 39.404 English inches : it is multiplied by prefixing the Greek numeral adjectives to the word metre : thus, the Decametre signifies 10 metres ; Hectometre, 8 -. Kilometre, 1000; and Myriametre, 10, 000 metres. The measures below a metre, are named in a similar' manner; the Latin numeral adjectives being substituted for those of the Greek : hence, a decimetre denotes the tenth part; centimetre, the hundreth part; and millimetre, the thousandth part of a metre. The standard measure of capacity is denominated a Litre, which is equivalent to 61.1816 English cubic inches, or about 1, 5-7th of a pint, ale-measure, and 2, l-10thof a pint, wine-measure. Its multiplication, and sub-multiplication, are performed in a similar manner. The Gramme is adapted to weighing bodies, and is equal to 15.4457 English grains, Troy-weight. Its divisions, and sub-divisions, correspond with those of the metre. The French are is employed for measuring the superficies of land, and is equal to IO76, 2-5ths square feet, or no, 3-5th square yards, or about one-fortieth part of an acre. Lastly, the Store is used in mea-suring wood for fuel: it is equal to 35.31467 cubic feet. 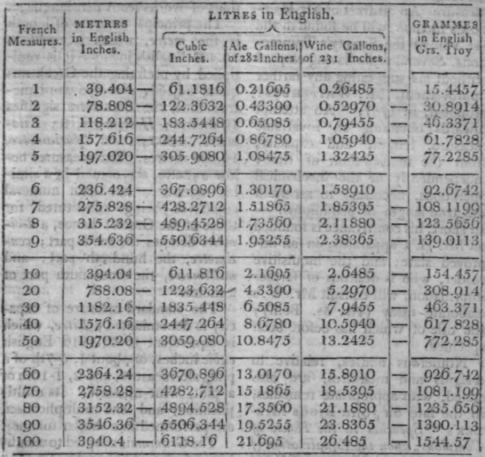 A Comparative Table of the Unities of the French Metres, Litres, and Grammes, with their corresponding English Inches, Gallons and Grains. From the table here given, the English weights and measures, corresponding with those used in France, may be easily ascertained, by multiplying the hundreds, and adding the tenths and units, as circumstances may direct ; or, if the number be less than one hundred, by adding the units to the tens. After the number required is thus found, it may be reduced to English feet, or inches; to quarts or pints; to pounds, ounces, drams, or grains, by means of the common rules of arithmetic. A more ample specification of these weight and measures is published in the 3d vol. of Mr. Nicholson's "Journal;" and which is abstracted from a report published in 1799, at Paris, by authority of the French government. In the year 1791, the Society for the Encouragement of Arts, etc. gave a bounty of 20 guineas to M. Han in, of Paris, for his weighing machine; in which the weights of the principal countries of Europe, together with their relative differences, may be ascertained at one view ; view: - as a description of this contrivance would be unintelligible, without the aid of engravings, we refer the reader to the 9th vol. of the Society's "Transactions, " etc. which contains a complete analysis of the subject, illustrated with two plates.